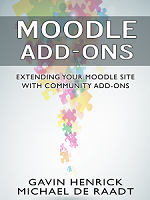 So with the latest release of Moodle 2 (2.0.2) which was released in Feb, what did we get in changes and improvements? Although it is possible to browser through all the tracker changes on the Moodle.org site, It is easier to read the summary of these on the release notes page. There are 220 fixes gone into Moodle 2.0.2 which included quite a few Performance improvements as well as a lot of bug fixes and security issue solutions. Some of the key feature changes, include new options to show feedback, averages, range and other data in the user report but most importantly now all standard blocks have an option to dock. For those fans of docking, this is a welcome fix. But as mentioned, this was 3 weeks ago, and what has happened since? There are currently 412 tickets for version 2.0.3 and of these 23% are already closed and 10 more tickets are fixed but awaiting review. Most of the remaining issues are minor (69%). So even with just a few weeks gone, good progress is being made solving and tackling any of the outstanding tickets that have been raised.